February 6, 2019 Dubai, United Arab Emirates: At Google, we build protection into everything we make, so our users can be confident that their personal information is secure. 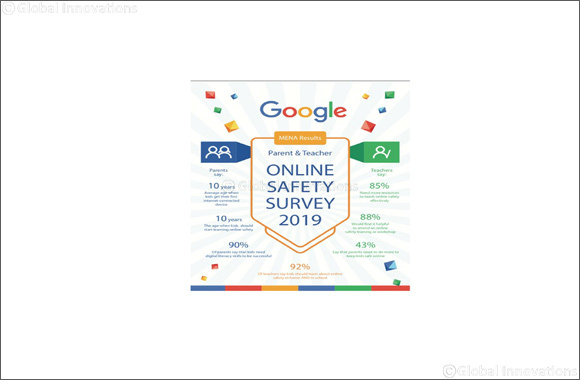 According to a recent survey we conducted in MENA for parents and teachers, we found that parents believe that children should learn about online safety and digital citizenship at 10 years old. The research also shows that 43% of teachers say that parents need to do more to keep kids safe online. Additionally, 85% of teachers feel that they need more resources to teach online safety to your students. To help protect your online activity, always run the latest version of software across the web browsers, operating systems, and applications on all your devices. Some services, including the Chrome browser, will automatically update themselves. Other services may notify you when it’s time to update. Using the same password to log in to multiple accounts increases your security risk. It’s like using the same key to lock your home, car and office – if someone gains access to one, all of them could be compromised. Create a unique password for each account to eliminate this risk and keep your accounts more secure. Along with creating unique passwords, make sure that each password is hard to guess and better yet, at least eight characters long. Consider using a password manager, like the one built into your Chrome browser, to help you create, safeguard and keep track of all the passwords for your online accounts. Taking the Security Checkup doesn’t just help you stay safer while using Google. The Checkup also includes helpful tips to keep you safer across the web, such as by reminding you to add a screen lock to your mobile phone, reviewing third-party access to your Google Account data, and showing you what sites and apps you may have signed in to using your Google Account. Go to g.co/securitycheckup to take your Security Checkup. Adding recovery information—such as a phone number or back up email address—to your account can help you more quickly get back into your account if you ever lose access or can't sign in. Remember to update the information if you change phone number or email address. For many web services, a recovery phone number or email address can be used to notify you if there's suspicious activity in your account, or can help to block someone from using your account without permission. Go one step further to secure your accounts by setting up 2-Step Verification, which requires you to use a second step—like entering a 6-digit code generated by the Google Authenticator app—in addition to your username and password to sign in to your account. Setting up 2-Step Verification will significantly decrease the chance of someone gaining unauthorized access to your account. Once you set up 2-Step Verification for an account, remember to be ready for the second verification step each time you sign in. Just like we teach our kids how to drive before handing our kids the keys to the car, it’s helpful to teach younger kids the basics of online safety and citizenship before handing them a device. A great way to get started is to review the ‘Abtal Al Internet’ guide together. You can teach them about being kind online, how to make strong passwords, what is appropriate to share online with whom, how to spot online scams, and when it’s time to consult a trusted adult. They can also reinforce all of these topics by playing the ‘Aalam Al Internet’ online.